It only took about 6 hours for the 24 players that returned for Day 5 of the EPT San Remo Main Event to play down to the final table of 8 players, and it was two players in particular, Rupert Elder and Max Heinzelmann, who would benefit the most from Day 5’s action. Heinzelmann and Elder will enter the final table virtually even in chips with about 8 million chips each, putting both players way out in front of the next nearest competitor Robert Spada who is sitting on 4.775 million chips. From there the discrepancy between the remaining players and the two players sitting atop the leader-board is even more pronounced, which should be no surprise considering Heinzelmann and Elder have over ½ the chips in play between them. One player they will both be watching closely will be Team PokerStars Pro Max Lykov, who will enter the final table with just under 1.5 million in chips. 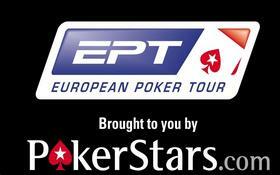 The final table will began at noon local time, and poker fans can follow the action on EPT Live. This entry was posted on Tuesday, May 3rd, 2011 at 4:49 am and is filed under Poker News. You can follow any responses to this entry through the RSS 2.0 feed. You can leave a response, or trackback from your own site.